©2010 Ellen Datlow (P)2013 Audible, Inc. Some stories were great. I particularly liked the one about the barn paintings and George RR Martins offering. As a whole some stories were so bad I had to skip them half way through. The author bios were also a little obnoxious and repetitive. Should be subtitled: "For People Who Hate Cats"
Really pretty disgusted with most of the stories I've listened to so far. With perhaps one or two exceptions, the first 6 or 8 stories include cats coming to gory ends. Burning, skinning, killed, cooked, and eaten, "euthanized" and dissected. I can't take any more. I'm returning this title. I wanted something calming to listen to on my commute to and from work. This one will lead to "road rage". If you love cats, or living things in general, I'd give this a pass. I've only listened to about the first third of the volume, so maybe all the rest are sweet, loving stories. But I doubt it. 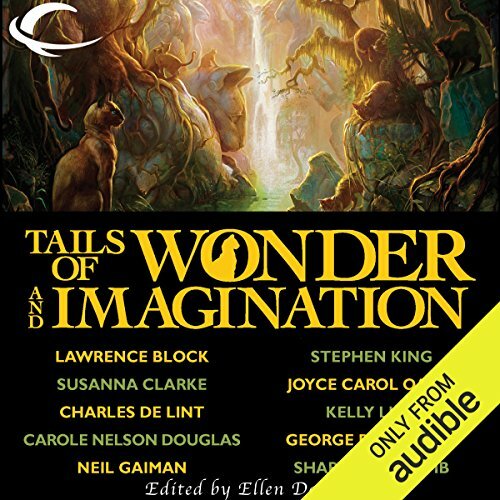 What disappointed you about Tails of Wonder and Imagination? Several of the introductions were the same. Exactly the same for different stories. All the stories were listed as Chapters, not by title. The male narrator was easy to listen to, but OMG I will never ever ever buy another audible book narrated by the female one again. I didn't realize she was the same one that narrated all the Hunger Games books and I would never have bought this if I had realized. Worse than a dentist drill is her voice. Worse than fingernails on a chalkboard. I. Am. Not. Kidding. She cannot do a different accent to save her life. Awful. An excellent collection of mostly modern tales with felines of some shape or shade atbthe heart of them. Some do, however, reflect on humans less than caring behaviours towards these beautiful creatures - a couple are quite violent, but in service to the story being told. For the mature cat fancier, this is a tasty smorgasbord of small bites and near-entrées served up to delight those who savour all things remotely related to Family Felidae (including one of the House Smilodon). This collection wants for some better editing and narration. One story's introduction/ bio of author was read twice, by two different women. I daresay if I noted it, an editor should have. The stories ranged from just okay to uninteresting. I cannot recommend others make my mistake and spend time or money on this volume. Some of the worst stories I've ever heard. For the life of me I can't see why any respectable publisher would ever put this out unless nobody was writing at the time. We're they looking for the writer with the least talent? If I could I would really give this 1.5 stars. After a few stories I just fell asleep. I was hoping it would get better but it never did. A collection of stories by great authors containing some great stories and some not so exciting stories. Worth reading for the sake of the good tales that comprise half the stories in the book. I found the stories of the witch and the space trader aka terraformer, quite entertaining. The narration was adequate, but some bits were being repeated especially the details about the authors. Story 12 is horrible, if you like a story about killing cats this is for you! Some of the story's are extremely well written and preformed. Why they would include such a dark story within this book is beyond me. This collection of short stories blew me away! Each individual story is so unique. None of the stories in this book share anything more than cats. Beyind that every story is different and they are all amazing in their own ways. This book is a lot longer than i thought so that was a nice surprise. This is a must read as the stories will take you on some fun but sometimes emotional rides, with a little bizarre/scary/weird thrown in for a great mix. Thumbs up all the way!!! Loved it!